Many high schoolers look forward to reading “the classics” with the same enthusiasm that they have for taking long, fairly pointless standardized exams like the SAT. Some of them actually seem disappointed when we can produce (at my library) a copy of Beowulf or Julius Caesar or The Scarlet Letter. That’s how much they want to read it. Having said that, there are a few classics which seem to have more natural appeal (than their boring competitors) to 21st century American teenagers; The Turn of the Screw by Henry James is one of them. First of all, it’s short. That matters immensely to high school students. But more importantly, it’s a ghost story. It’s fun, and it keeps you guessing, especially about the mental health of some of the characters. 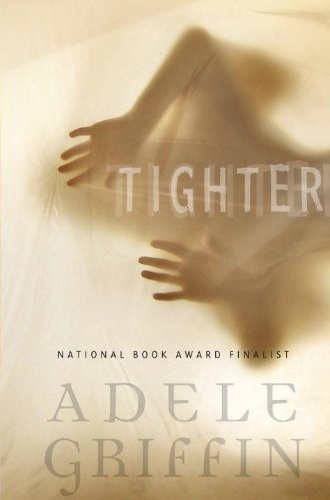 Tighter by Adele Griffin is a fast-paced, clever, well-written adaptation of The Turn of the Screw. There are parts in which the parallels of James’ novella are tighter than others, but that’s to be expected for a creatively done adaptation: too close and it becomes tedious. Jamie, the nanny, looks eerily like the former nanny, Jessie, who died. Jamie is in charge of a young girl Isa, whose absentee father is on business and really doesn’t want to be contacted. The housekeeper, Connie (a.k.a, the Funsicle), is the sometimes friendly, sometimes suspicious watchful eye of the house. And then there are the local teenagers: good-looking, charismatic, and party-loving. There’s enough 21st century America teen life (dating, drinking, socializing, checking people out on Facebook, etc.) in it to make it both interesting and credible. Jamie sees dead people. There’s no other way to say it. She’s particularly drawn to suicides, too. More so than most people, she is attuned to the moods and spirits of a place. She’s a complex protagonist: on one hand, she’s a responsible, caring nanny who can put up with the tedium and isolation which comes with being a nanny. On the other hand, she stole a bunch of prescription medication (painkillers, antihistamines, sleeping pills) from her parents and pops them regularly without bothering to check what type of pill she’s popping. She’s obsessed with the former nanny, Jessie, and her (also dead) boyfriend, Peter Quint, to the point of making field trips to places which were associated with those two. Yeah, she’s kind of a stalker. Of dead people. And she’s always quoting nursery rhymes to herself, even when not on the pills. Unreliable narrator? Hormonal teenager? Girl in the wrong century? I can’t go too much into the story without giving away some spoilers, and this one has very cool plot twists. If anyone wanted to jazz up an English lit curriculum, it’d be fun for the kids to read Tighter and then The Turn of the Screw, or vice versa. Now that a fair number of YA novels are being made into movies, this one would be perfect. This entry was posted in Uncategorized and tagged adaptation of classic literature, Best YA 2011, crossover, female protagonists, ghost story, gothic, mental illness. Bookmark the permalink.